Description: CSS&SB Alco-GE 702 at Michigan City, Indiana on October 23, 1965, Kodachrome by Chuck Zeiler. Number 702 was built in 1931 by Alco-GE for the NYC as C-C class R-2 314 (c/n's Alco 68242, GE 11165) for the West Side (NYC) freight electrification. 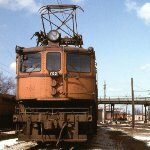 When the NYC dieselized that line, the R-2's became surplus, and the South Shore purchased 10 of the units (at a cost of $9,000.00 each), overhauled and rewired eight of them (at a cost of $88,248.00 each). They were converted from NYC's 600 volt DC to the South Shore's 1500 volt DC system and became road #'s 700-707. This unit was put into service in 1955, weighed 140 tons, and developed 3000 horsepower. The pantographs, compressors, motor blowers, and series-parallel switches were from former Cleveland Union Terminal 700 class locomotives, also built by Alco-GE for the NYC. 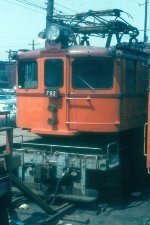 The South Shore's 700 series locomotives were all retired in 1975.